1801. 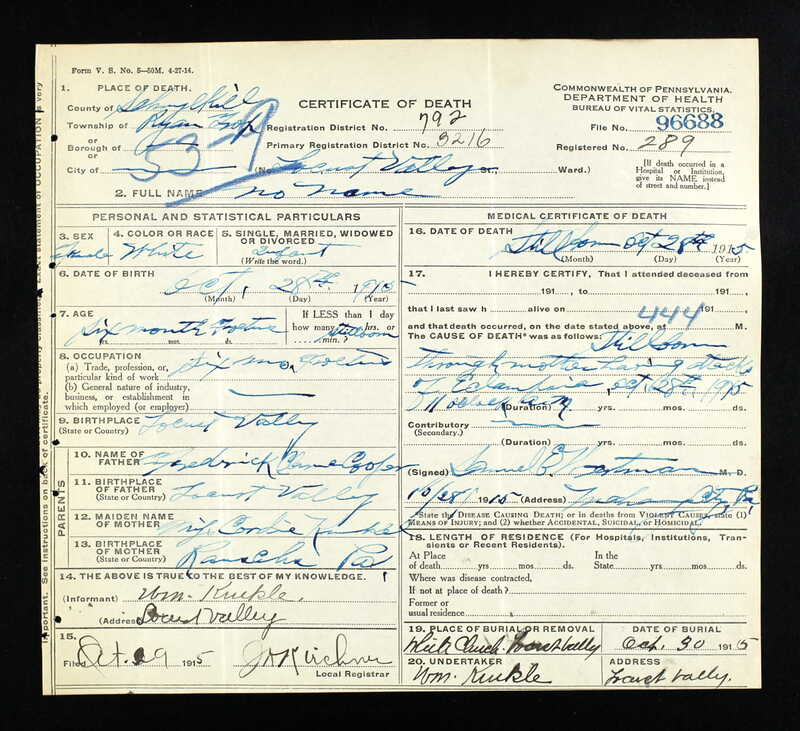 Lillian Mae DAVIS 1 (Anna Elizabeth BITLER , Franklin Nelson BITTLER , Mark , John , Johannes ) was born in Jul 1885 in Shenandoah, Schuylkill Co, PA.
Lillian resided in 1900 in 135 Park St, Lawrence, Essex Co, MA. She worked as At School in 1900. She resided in Apr 1909 in Lawrence, Essex Co, MA. She worked as Clerk in Apr 1909. She resided in 1910 in 79 Maple St, Lawrence, Essex Co, MA. She resided in 1920 in 89 Trenton St, Lawrence, Essex Co, MA. She worked as Burler with Woven Woolen Mills in 1920. She resided in 1930 in 89 Trenton St, Lawrence, Essex Co, MA. She resided in 1940 in 89 Trenton St, Lawrence, Essex Co, MA. Lillian married Franklin BURNS, son of Jesse BURNS and Annie CONROY, on 21 Apr 1909 in Lawrence, Essex Co, MA. Franklin was born about 1886 in Lawrence, Essex Co, MA. Franklin resided in Apr 1909 in North Andover, Essex Co, MA. He worked as Section Hand in Apr 1909. He resided in 1910 in 79 Maple St, Lawrence, Essex Co, MA. He worked as Section Hand - Norsted Mill in 1910. He resided in 1920 in 89 Trenton St, Lawrence, Essex Co, MA. He worked as Section Hand with Washington Mill in 1920. He resided in 1930 in 89 Trenton St, Lawrence, Essex Co, MA. He worked as Second Hand - Woolen Mill in 1930. He resided in 1940 in 89 Trenton St, Lawrence, Essex Co, MA. He worked as second hand - textile mill in 1940. 4842 F i Mildred BURNS. 1803. Ervin DAVIS [scrapbook] 1 (Anna Elizabeth BITLER , Franklin Nelson BITTLER , Mark , John , Johannes ) was born on 7 Nov 1895 in Shenandoah, Schuylkill Co, PA. He died on 7 Sep 1965. Ervin resided in 1900 in 135 Park St, Lawrence, Essex Co, MA. He resided in 1910 in 79 Maple St, Lawrence, Essex Co, MA. 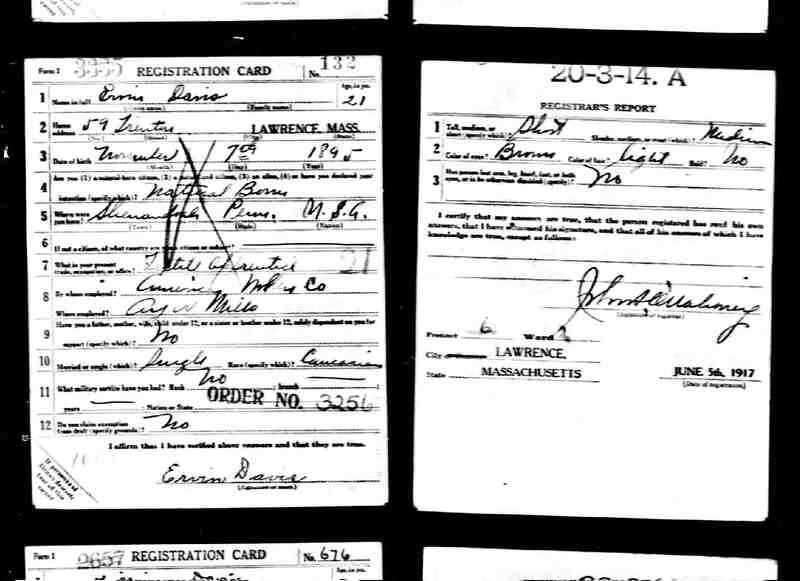 He resided in Jun 1917 in 59 Trenton St, Lawrence, Essex Co, MA. He worked as Textile Apprentice with American ?????? Co in Jun 1917. He was a member of Masons - Phoenician Lodge. He resided in 1920 in 59 Trenton St, Lawrence, Essex Co, MA. He worked as Laborer - Woolen Mill in 1920. He resided in 1930 in 78 Edgemont, Braintree, Norfolk Co, MA. He worked as merchant - bakery in 1930. He was a member of Masons - Delta Lodge. He resided in 1940 in 35 Bellevue St, E Braintree, Norfolk Co, MA. He worked as proprietor - bakery in 1940. He resided in 1942 in 35 Bellevue Rd, E Braintree, Norfolk Co, MA. He worked as self employed in 1942. He resided in Sep 1965 in East Braintree, Norfolk Co, MA. Ervin married Florence H about 1922. Florence was born about 1896 in Canada. Florence immigrated in 1897 to United States from Canada. She resided in 1930 in 78 Edgemont, Braintree, Norfolk Co, MA. She resided in 1940 in 35 Bellevue St, E Braintree, Norfolk Co, MA. She worked as housewife in 1940. She resided in 1942 in 35 Bellevue Rd, E Braintree, Norfolk Co, MA. 4843 M i Ervin DAVIS Jr.
4844 F ii Helen M DAVIS. 4845 M iii John H DAVIS. 1808. 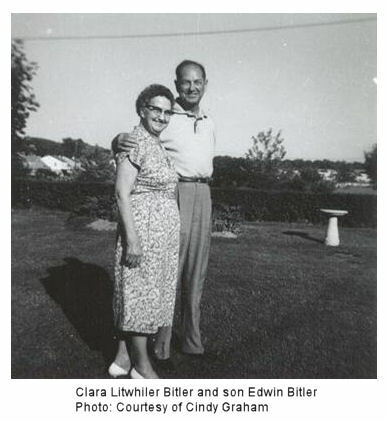 Edwin Franklin BITLER [scrapbook] 1, 2, 3, 4 (Nelson G BITTLER , Franklin Nelson BITTLER , Mark , John , Johannes ) was born on 20 Mar 1903 in Catawissa, Columbia Co, PA. He was christened on 27 Jun 1903 in Reformed Church, Numidia, Locust Twp, Columbia Co, PA. He died on 4 Apr 1982 in Escondito, San Diego Co, CA. He was buried on 15 Jul 1982 in Plot R C-89, Fort Rosecrans National Cemetery, Point Loma, San Diego Co, CA. Edwin resided in 1910 in Schuylkill Co, PA. He served in the military with LT COL USA. He resided in 1925 in Shenandoah, Schuylkill Co, PA. He resided in 1930 in Los Angeles, CA. He was issued a social security number in 1952 in CA. He resided in Apr 1982 in Escondito, San Diego Co, CA. 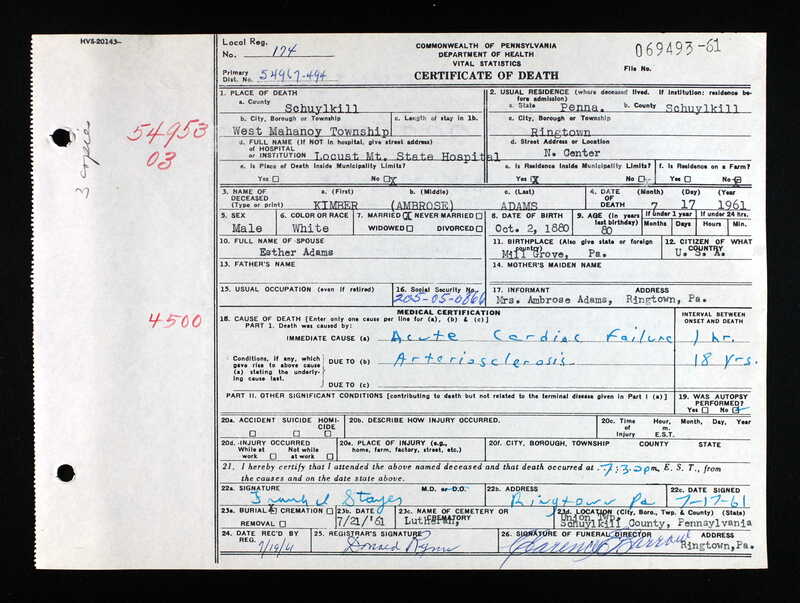 Edwin married Caroline Elizabeth MACHULSKY "Carol" 1, 2, 3, daughter of Joseph MACHULSKY and Isabel STASANKEWICZ/STEFANAVAGE, on 17 Jul 1927 in Church Of St George, Shenandoah, Schuylkill Co, PA. Carol was born on 17 Jan 1907 in Motherwell, Scotland. She died on 6 Aug 1989 in Escondito, San Diego Co, CA. She was buried on 10 Aug 1989 in Plot R C-89, Fort Rosecrans National Cemetery, Point Loma, San Diego Co, CA. Carol immigrated in 1909 to Scotland -> NYC (Ship Caladonia). She resided in 1930 in Los Angeles, CA. She was also know as Caroline Elizabeth Mitchell. Nelson BITLER 1 was born on 8 Sep 1931 in Los Angeles, Los Angeles Co, CA. He died on 8 Sep 1931 in Los Angeles, Los Angeles Co, CA. + 4847 M ii Edward Nelson BITLER was born on 12 Nov 1933. He died on 30 May 2005. + 4848 M iii Don Allan BITLER. Clara BITLER 1 was born on 7 Jul 1938 in Los Angeles Co, CA. She died on 7 Jul 1938 in Los Angeles, Los Angeles Co, CA. + 4850 F v Suzanne Lea "Suzi" BITLER was born on 10 Oct 1940. She died on 5 Nov 2016. 1811. 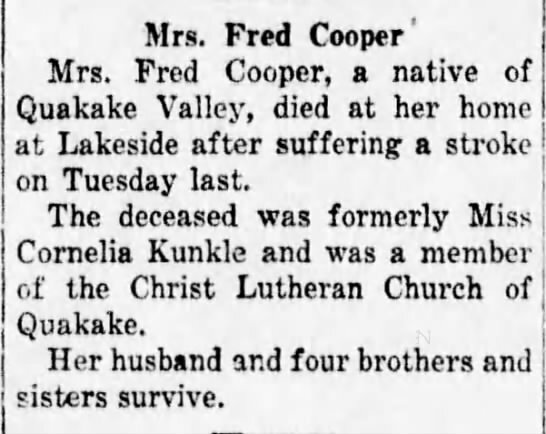 Frederick Clarence "Fred" COOPER [scrapbook] 1, 2, 3 (Elmira Catherine YOST , Dianna BITLER , Mark , John , Johannes ) was born on 30 Jun 1895 in Lakeside, Ryan Twp, Schuylkill Co, PA. He died in 1986. He was buried in Christ Lutheran Church Cemetery, Barnesville, Schuylkill Co, PA.
Fred resided in 1900 in Ryan Twp, Schuylkill Co, PA. He resided in 1910 in Ryan Twp, Schuylkill Co, PA. He resided in 1915 in Barnesville, Schuylkill Co, PA. He resided in Jun 1917 in RFD 1, Mahanoy City, Schuylkill Co, PA. He worked as Farm Laborer in Jun 1917. He resided in 1920 in Ryan Twp, Schuylkill Co, PA. He worked as Laborer - Car Shops in 1920. He resided in 1930 in Ryan Twp, Schuylkill Co, PA. He worked as Repairman - Car Shop in 1930. He resided in 1940 in Lakeside, Ryan Twp, Schuylkill Co, PA. He resided in 1942 in Ryan Twp, Schuylkill Co, PA. He worked with Reading Railroad Co in 1942. Fred married Cordie A KUNKLE [scrapbook] 1, daughter of William KUNKLE and Mary NEATER, on 21 Aug 1915 in St Joseph's Evangelical Lutheran Church, Allentown, Lehigh Co, PA. Cordie was born on 16 Apr 1885 in Rauschs, Schuylkill Co, PA. She died on 30 Dec 1936 in Ryan Twp, Schuylkill Co, PA. She was buried on 4 Jan 1937 in Christ Lutheran Church Cemetery, Barnesville, Schuylkill Co, PA.
Cordie resided in 1915 in Barnesville, Schuylkill Co, PA. She resided in 1930 in Ryan Twp, Schuylkill Co, PA.
[Stillborn Female] COOPER [scrapbook] was born on 25 Oct 1915 in Locust Valley, Ryan Twp, Schuylkill Co, PA. She died on 25 Oct 1915 in Locust Valley, Ryan Twp, Schuylkill Co, PA. She was buried on 30 Oct 1915 in Christ Lutheran Church Cemetery, Barnesville, Schuylkill Co, PA.
Fred also married Mary L SHAFER, daughter of Samuel SHAFER and KLIDA N, on 9 Jan 1938. Mary was born in 1901. She died in 1991. She was buried in White Church Cemetery, Rush Twp, Schuylkill Co, PA.
1812. Mary Ellen COOPER [scrapbook] 1, 2, 3 (Elmira Catherine YOST , Dianna BITLER , Mark , John , Johannes ) was born on 6 Oct 1897 in PA. She died on 10 Dec 1986. She was buried in Row 7, St Peter's UCC Cemetery, Ryan Twp, Schuylkill Co, PA.
Mary resided in 1900 in Ryan Twp, Schuylkill Co, PA. She resided in 1910 in Ryan Twp, Schuylkill Co, PA. She resided in 1930 in 7323 Lansdale Ave, Philadelphia, Philadelphia Co, PA. She resided in 1940 in 3420 6th St, Philadelphia, Philadelphia Co, PA. She resided in 1942 in 3420 N 6th St, Philadelphia, Philadelphia Co, PA.
Mary married John Ralph HARING [scrapbook] 1, 2, son of John HARING and Stella, in 1911/1930 in Schuylkill Co, PA. John was born on 31 Mar 1904 in PA. He was baptized 3 on 12 Jun 1904 in Trinity Lutheran Church, Perkasie, Bucks Co, PA. He died in Philadelphia Co, PA.
John resided in 1930 in 7323 Lansdale Ave, Philadelphia, Philadelphia Co, PA. He worked as electrician - electrical ????? (not working) in 1930. He resided in 1940 in 3420 6th St, Philadelphia, Philadelphia Co, PA. He worked as grinder - steel company in 1940. + 4852 M i Raymond K HARING was born on 24 Apr 1924. He died on 22 Nov 2011. 4853 F ii Doris HARING. + 4854 F iii Joann Bette HARING was born on 8 Dec 1938. She died on 2 Aug 2001. 1821. Charles Thomas YOST (William H YOST , Dianna BITLER , Mark , John , Johannes ) was born on 24 Jul 1893 in Mahanoy City, Schuylkill Co, PA. He died on 6 Jan 1973 in Pompano Beach, Broward Co, FL. He was buried in Wentz UCC Cemetery, Worcester, Montgomery Co, PA.
Charles resided in 1900 in Lower Towamensing Twp, Carbon Co, PA. He resided in 1910 in 933 Melon St, Philadelphia, Philadelphia Co, PA. He worked as helper - machine shop in 1910. He resided in 1930 in 244 Locust Ave, Abington, Montgomery Co, PA. He resided in 1940 in 244 Locust Ave, Abington, Montgomery Co, PA. He worked as engineer - recording & instrument factory in 1940. Charles married Florence M. Florence was born in 1898 in PA. She died in 1984. She was buried in Wentz UCC Cemetery, Worcester, Montgomery Co, PA.
Florence resided in 1930 in 244 Locust Ave, Abington, Montgomery Co, PA. She resided in 1940 in 244 Locust Ave, Abington, Montgomery Co, PA.
4855 F i Elsie J YOST. 4856 M ii Frank Charles YOST. 1822. Lawrence Nathaniel YOST (William H YOST , Dianna BITLER , Mark , John , Johannes ) was born on 10 Jan 1895 in PA. He died on 19 Aug 1975 in Jenkintown, Montgomery Co, PA.
Lawrence resided in 1900 in Lower Towamensing Twp, Carbon Co, PA. He resided in 1910 in 933 Melon St, Philadelphia, Philadelphia Co, PA. He worked as label boy - bakery in 1910. He resided in 1920 in Forest Ave, Abington, Montgomery Co, PA. He worked as electrician - steel mill in 1920. He resided in 1930 in 8501 Forrest Ave, Abington, Montgomery Co, PA. He worked as electrician with Globe Ticket Co. in 1930. He resided in 1940 in 8501 Forrest Ave, Abington, Montgomery Co, PA. He worked as electrician - ticket company in 1940. Lawrence married Emma Parsley WINNEMORE, daughter of Wiliam Casper WINNEMORE and Annie Lucas CAMPBELL. Emma was born on 13 Mar 1895 in Philadelphia, Philadelphia Co, PA. She died on 20 Mar 1976 in Philadelphia, Philadelphia Co, PA.
Emma resided in 1920 in Forest Ave, Abington, Montgomery Co, PA. She resided in 1930 in 8501 Forrest Ave, Abington, Montgomery Co, PA. She resided in 1940 in 8501 Forrest Ave, Abington, Montgomery Co, PA.
Lawrence Nathaniel YOST was born on 20 May 1915 in Philadelphia, Philadelphia Co, PA. He died on 14 Mar 1972 in Harrisburg, Dauphin Co, PA.
Lawrence resided in 1920 in Forest Ave, Abington, Montgomery Co, PA. 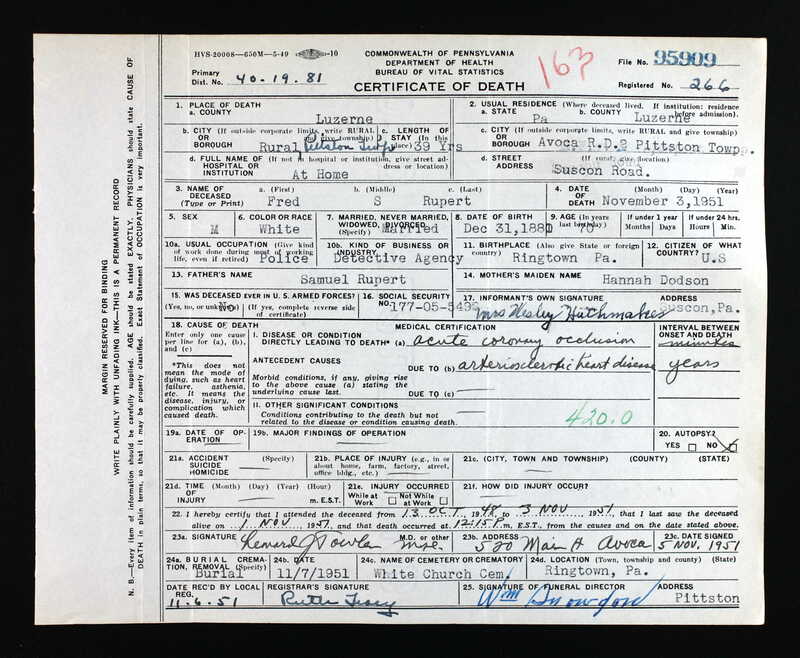 He resided in 1930 in 8501 Forrest Ave, Abington, Montgomery Co, PA.
Lawrence married Jane Meredith CRULL in Feb 1939 in MD. 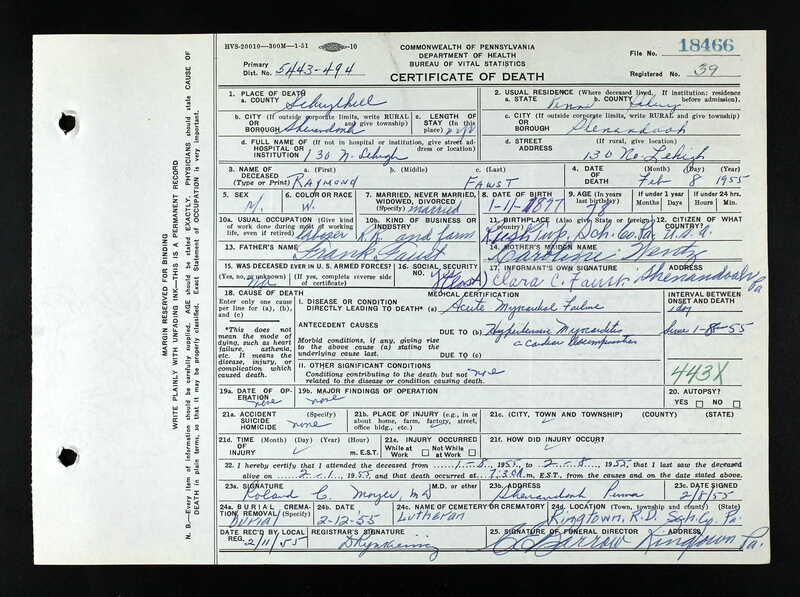 Jane was born on 22 May 1919 in Allegany, Potter Co, PA. She died on 20 Oct 1979 in Camp Hill, Cumberland Co, PA.
+ 4858 M ii William H YOST Sr was born on 5 Feb 1917. He died on 28 Feb 1990. Wilbert James YOST [scrapbook] was born on 31 Jul 1918 in Philadelphia, Philadelphia Co, PA. He died on 31 Mar 1961 in Ardsley, Abington Twp, Montgomery Co, PA. 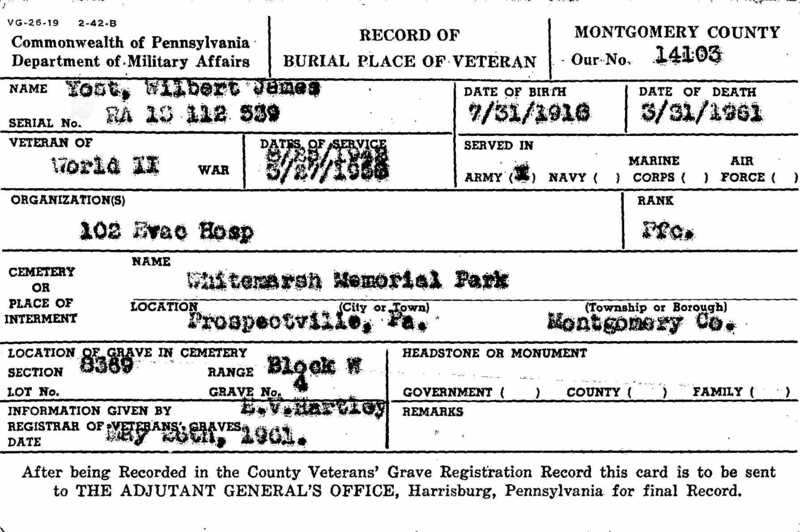 He was buried on 4 Apr 1961 in Sec 8389 Block W Gr 4, Whitemarsh Memorial Park, Ambler, Montgomery Co, PA.
Wilbert resided in 1920 in Forest Ave, Abington, Montgomery Co, PA. He resided in 1930 in 8501 Forrest Ave, Abington, Montgomery Co, PA. He resided in 1940 in 8501 Forrest Ave, Abington, Montgomery Co, PA. He worked as fly-boy - printing est. in 1940. He was issued a social security number in PA. He served in the military with U.S. Army - PFC from 25 Aug 1942 to 27 Mar 1950 in WW II. He resided in 1961 in 667 Harnel Ave, Ardsley, Montgomery Co, PA. He worked as photo engraver in 1961. + 4860 M iv James Sheldon YOST was born on 10 Nov 1923. He died on 13 Aug 1987. 1823. Marguerite YOST (William H YOST , Dianna BITLER , Mark , John , Johannes ) was born in Sep 1898 in PA.
Marguerite resided in 1900 in Lower Towamensing Twp, Carbon Co, PA. She resided in 1910 in 933 Melon St, Philadelphia, Philadelphia Co, PA. She resided in 1920 in 4323 N 17th St, Philadelphia, Philadelphia Co, PA. She worked as packer - pork products in 1920. She resided in 1940 in 4323 N 17th St, Philadelphia, Philadelphia Co, PA. She worked as presser - laundry in 1940. 4861 F i Eleanor SMALL. 1828. George J YOST Jr [scrapbook] 1, 2, 3, 4, 5 (George O YOST , Dianna BITLER , Mark , John , Johannes ) was born on 21 Jan 1893 in Barnesville, Schuylkill Co, PA. He died on 18 Mar 1975 in Locust Mountain Hospital, Shenandoah, Schuylkill Co, PA. He was buried on 21 Mar 1975 in White Church Cemetery, Rush Twp, Schuylkill Co, PA.
George resided in 1910 in Rush Twp, Schuylkill Co, PA. He worked as apprentice carpenter in 1910. He served in the military with U.S. Army in WW I. He resided in 1940 in Park Crest Pond, Ryan Twp, Schuylkill Co, PA. He resided in Feb 1954 in Harrisburg, Dauphin Co, PA. He resided in Dec 1956 in NJ. He worked as miner and carpenter. He resided in Mar 1975 in Park Crest, Ryan Twp, Schuylkill Co, PA. He was a member of Ryan Township Fire Company (charter member). He was a member of VFW Post 1420 in Mahanoy City, PA.
George married Blanche HUBLER 1, 2, 3, daughter of Pernella, in 1911/1930 in Schuylkill Co, PA. Blanche was born in 1899. She died in 1982. 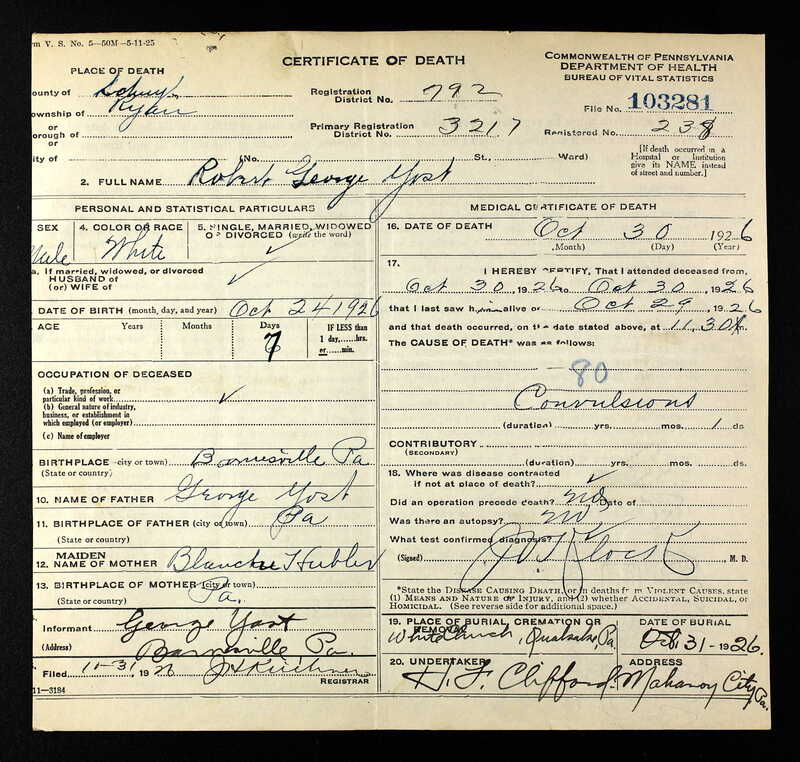 She was buried in White Church Cemetery, Rush Twp, Schuylkill Co, PA.
Blanche resided in 1940 in Park Crest Pond, Ryan Twp, Schuylkill Co, PA.
+ 4862 F i Faye Almeda YOST was born on 18 Feb 1920. She died on 23 Feb 1991. Jack Richard YOST [scrapbook] 1, 2, 3 was born on 15 Aug 1922 in PA. Jack died in Feb 1982. Jack was buried in White Church Cemetery, Rush Twp, Schuylkill Co, PA.
Jack resided in 1940 in Park Crest Pond, Ryan Twp, Schuylkill Co, PA. Jack served in the military with U.S. Air Force from 30 Oct 1942 to 21 Dec 1945. Jack resided in 1975 in Park Crest, Ryan Twp, Schuylkill Co, PA. Jack resided in 1991 in Tamaqua, Schuylkill Co, PA.
+ 4864 F iii Ferne Priscilla YOST was born on 10 Sep 1924. She died in Jan 1988. Robert George YOST [scrapbook] 1 was born on 24 Oct 1926 in Barnesville, Schuylkill Co, PA. He died on 30 Oct 1926 in Ryan Twp, Schuylkill Co, PA. He was buried on 31 Oct 1926 in White Church Cemetery, Rush Twp, Schuylkill Co, PA.
William James YOST 1, 2, 3 was born on 16 Oct 1927 in Barnesville, Schuylkill Co, PA. He died on 31 Oct 1999 in Las Vegas, Clark Co, NV. William resided in 1940 in Park Crest Pond, Ryan Twp, Schuylkill Co, PA. He resided in 1975 in Trenton, Mercer Co, NJ. He resided in 1991 in Bell Mead, NJ. + 4867 F vi Phyllis C YOST. + 4868 F vii Dorothy A YOST was born in 1931. She died on 2 May 1982. + 4869 F viii Muriel E YOST. + 4870 M ix Walter YOST was born on 8 Dec 1934. He died on 1 Jan 2011. 4871 M x Richard YOST. 1830. Fredrick Sylvester RUPERT [scrapbook] 1, 2, 3, 4, 5 (Hannah Elizabeth DODSON , Caroline BITLER , Mark , John , Johannes ) was born on 31 Dec 1880 in Ringtown, Schuylkill Co, PA. He died on 3 Nov 1951 in At Home (near Hartz Store), Pittston Twp, Luzerne Co, PA. He was buried on 7 Nov 1951 in St. Paul's (Old White Church) Church, Ringtown, Schuylkill Co, PA.
Fredrick resided in 1900 in East Union Twp, Schuylkill Co, PA. He worked as farm laborer in 1900. He resided in 1910 in Union Twp, Schuylkill Co, PA. He worked as powder maker - powder mill in 1910. He resided in 1920 in Suscon Village, PIttston Twp, Luzerne Co, PA. He worked as foreman - powder mill in 1920. He resided in 1930 in 413 Beat Rd, PIttston Twp, Luzerne Co, PA. He worked as keeper - powder mill in 1930. He was issued a social security number . He resided in 1940 in Bear Creek Rd, Pittston Twp, Luzerne Co, PA. He resided in Nov 1951 in Suscon Rd, Pittston Twp, Luzerne Co, PA. He worked as police - detective agency in Nov 1951. Fredrick married Matilda Catherine SHOUP [scrapbook] 1, 2, 3, 4, daughter of Pierce SHOUP and Sarah FOOS, about 1903. Matilda was born on 18 Dec 1884 in Shamokin, Northumberland Co, PA. She died on 6 Jan 1954 in At Home, Pittston Twp, Luzerne Co, PA. She was buried on 9 Jan 1954 in St. Paul's (Old White Church) Church, Ringtown, Schuylkill Co, PA.
Matilda resided in 1910 in Union Twp, Schuylkill Co, PA. She resided in 1920 in Suscon Village, PIttston Twp, Luzerne Co, PA. She resided in 1930 in 413 Beat Rd, PIttston Twp, Luzerne Co, PA. She resided in 1940 in Bear Creek Rd, Pittston Twp, Luzerne Co, PA.
+ 4872 F i Mabel Ester RUPERT was born on 24 May 1903. She died in Nov 1982. Ellen E RUPERT 1, 2, 3, 4, 5 was born on 1 Sep 1905 in Ringtown, Schuylkill Co, PA. She died on 13 Jun 1999 in WIlkes-Barre General Hospiotal, Wilkes-Barre, Luzerne Co, PA. She was buried on 16 Jun 1999 in Memorial Shrine Cemetery, Carverton, Luzerne Co, PA.
Ellen resided in 1910 in Union Twp, Schuylkill Co, PA. She resided in 1920 in Suscon Village, PIttston Twp, Luzerne Co, PA. She graduated from Pittston High School in 1923. She was issued a social security number . She resided in 1940 in Bear Creek Rd, Pittston Twp, Luzerne Co, PA. She worked as teacher - public school in 1940. She graduated with BS Education from Bloomsburg State Normal School in Bloomsburg, PA. She worked as school teacher (45 yrs) until 1970. She was a member of St. Peter's Lutheran Church (77 yrs) in Hughestown, Luzerne Co, PA.
Ellen married Elwood T SMITH. Estella C RUPERT 1, 2, 3, 4, 5 was born on 29 Mar 1907 in Ringtown, Schuylkill Co, PA. She died on 11 Mar 1996 in Wilkes-Barre General Hospital, Wilkes-Barre, Luzerne Co, PA. She was buried on 14 Mar 1996 in Memorial Shrine Cemetery, Carverton, Luzerne Co, PA.
Estella resided in 1910 in Union Twp, Schuylkill Co, PA. She resided in 1920 in Suscon Village, PIttston Twp, Luzerne Co, PA. She resided in 1930 in 413 Beat Rd, PIttston Twp, Luzerne Co, PA. She worked as office clerk with Isaac Long Department Store in 1930 in Wilkes-Barre, Luzerne Co, PA. She graduated from Pittston High School. She was issued a social security number before 1951 in PA. She worked with Bureau of Aging until 1988. She resided in Mar 1996 in Suscon Rd, Pittston Twp, Luzerne Co, PA. She was a member of St. Peter's Lutheran Church in Hughestown, Luzerne Co, PA.
Estella married Walter HATMAKER 1, 2, 3, 4. Walter died before Mar 1996. Lydia RUPERT 1, 2, 3, 4, 5 was born on 31 Dec 1910 in Ringtown, Schuylkill Co, PA. She died on 11 Oct 2005 in Wesley Village, Jenkins Twp, Luzerne Co, PA. She was buried on 13 Oct 2005 in Memorial Shrine Cemetery, Carverton, Luzerne Co, PA.
Lydia resided in 1920 in Suscon Village, PIttston Twp, Luzerne Co, PA. She resided in 1930 in 413 Beat Rd, PIttston Twp, Luzerne Co, PA. She resided in 1940 in Bear Creek Rd, Pittston Twp, Luzerne Co, PA. She worked as bookkeeper - Isaac Long department store in 1940. She resided in Plains Twp, Luzerne Co, PA. She resided in Pittston Twp, Luzerne Co, PA. She worked with Gort's Dress Factory. Lydia married Clarence C HIMM 1, 2, 3, 4. Clarence was born on 26 Oct 1909. He died on 5 Jan 1959. He was buried in Memorial Shrine Cemetery, Carverton, Luzerne Co, PA.
+ 4876 F v Marian Pauline RUPERT was born on 26 Feb 1918. She died on 13 Dec 2007. 1831. Clara Caroline RUPERT 1 (Hannah Elizabeth DODSON , Caroline BITLER , Mark , John , Johannes ) was born on 21 Jan 1883 in Brandonville, Schuylkill Co, PA. She died on 4 Mar 1965 in Ashland, Schuylkill Co, PA.
Clara resided in 1900 in East Union Twp, Schuylkill Co, PA. She resided in Nov 1951 in Ringtown, Schuylkill Co, PA.
Clara married Raymond Walter FAUST [scrapbook] 1, 2, son of Frank FAUST and Caroline WENTZ, about 1900 in Schuylkill Co, PA. Raymond was born on 11 Jan 1877 in Rush Twp, Schuylkill Co, PA. He died on 8 Feb 1955 in Shenandoah, Schuylkill Co, PA. He was buried on 12 Feb 1955 in St Johns Cemetery, Ringtown, Schuylkill Co, PA.
Raymond resided in 1900 in East Union Twp, Schuylkill Co, PA. He worked as laborer - powder mill in 1900. He worked as laborer - railroad and farm. 4877 F i Sara Irene FAUST. Sara married Frank Ephram MEISEL. Sara also married Ward Arlington RIEGEL. + 4878 M ii Walter Samuel FAUST was born on 1 Sep 1902. He died on 1 Nov 1945. Charles Franklin FAUST was born on 2 Dec 1903. He died on 25 Dec 1906. He was buried in St. John's Cemetery, Ringtown, Schuylkill Co, PA.
Evelyn FAUST was born on 8 May 1906 in Quakake, Schuylkill Co, PA. She died on 31 Dec 1906 in Rush Twp, Schuylkill Co, PA. She was buried in St. John's Cemetery, Ringtown, Schuylkill Co, PA.
Helen Valeria FAUST was born on 28 Jun 1900. 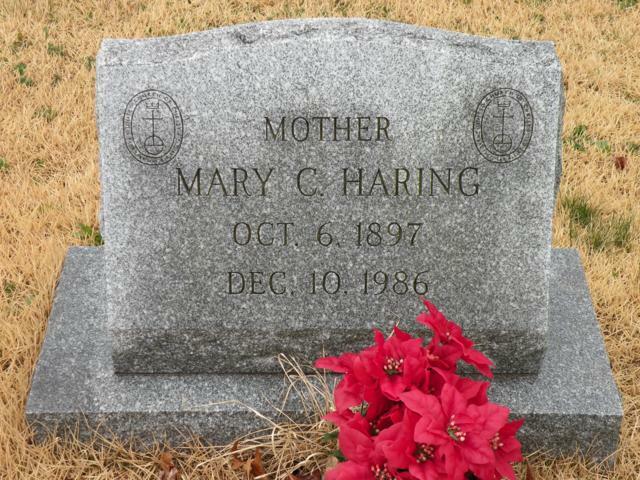 She died on 31 Dec 1906 in Rush Twp, Schuylkill Co, PA. She was buried in St John's Cemetery, Ringtown, Schuylkill Co, PA. The cause of her death was scarlet fever. 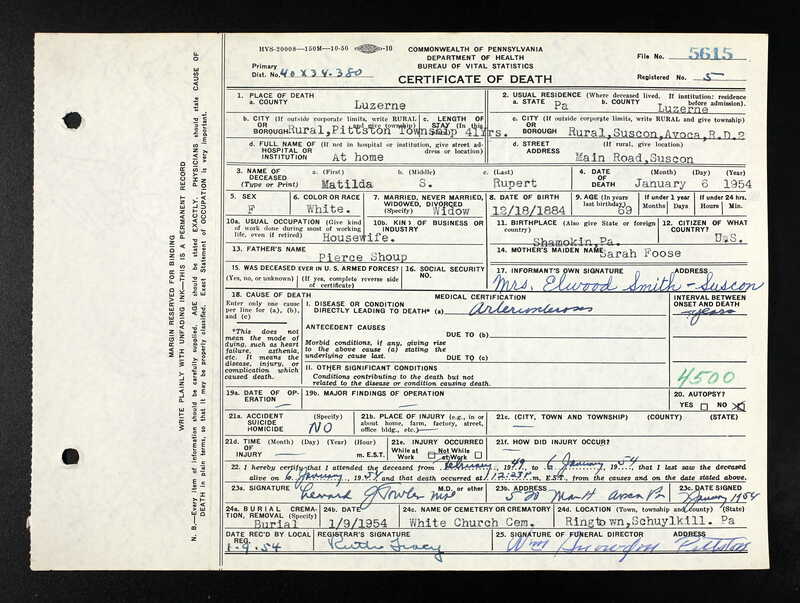 Elizabeth Kathryn FAUST was born on 1 Jan 1910. She died on 11 Jun 1999. She was buried in St. John's Cemetery, Ringtown, Schuylkill Co, PA.
Elizabeth married Archibald Gould BUCHER. 4883 F vii Mildred May FAUST. Mildred married Ernest C KIEFFER. Mildred also married Marvin Alvin LEACH [scrapbook], son of LEACH and Catherine. Marvin died on 4 Dec 1944 in Germany. He was buried in Christ Church Cemetery, Fountain Springs, Schuylkill Co, PA.
Marvin resides in 1940 in Butler Twp, Schuylkill Co, PA. He worked as gas station attendant - filling station in 1940. He served in the military with U.S. Army - Medic, Company L 12th Infantry 4th Army Division (KIA) from 15 Dec 1943 to 4 Dec 1944. 4884 M viii Howard J FAUST. 4885 F ix Violet Caroline FAUST. 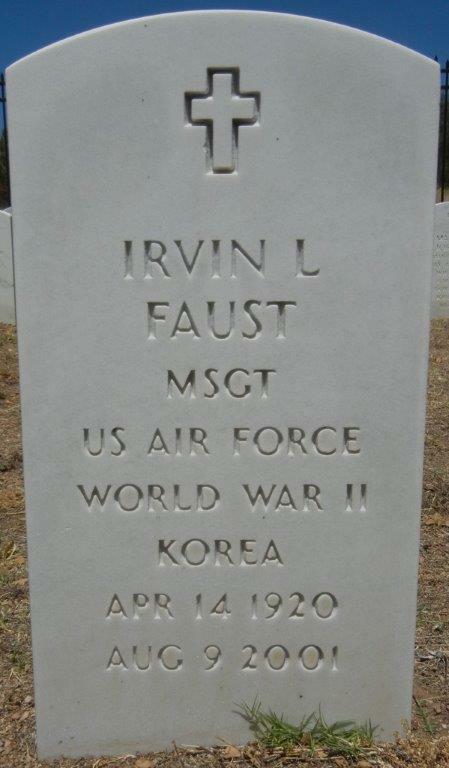 Irvin Leroy FAUST [scrapbook] 1 was born on 14 Apr 1920 in Quakake, Schuylkill Co, PA. He died on 9 Aug 2001 in AZ. He was buried in Sec 10 Site 956, Fort Huachuca Cemetery, Sierra Vista, Cochise Co, AZ. Irvin was issued a social security number . He served in the military with U.S. Air Force - M/Sgt in WW II, Korea. Irvin married Phyllis Hattie CLARK. 1832. Esther Elizabeth RUPERT 1 (Hannah Elizabeth DODSON , Caroline BITLER , Mark , John , Johannes ) was born on 22 Sep 1884 in Northumberland, Northumberland Co, PA. She died on 3 Jan 1966 in Schuylkill Haven, Schuylkill Co, PA.
Esther resided in 1900 in East Union Twp, Schuylkill Co, PA. She resided in 1930 in W Main St, Ringtown, Schuylkill Co, PA. She resided in Nov 1951 in Rocky Hill, NJ. Esther married Kimber Ambrose ADAMS [scrapbook] 1 about 1906 in Schuylkill Co, PA. Kimber was born on 2 Oct 1880 in Millgrove, Columbia Co, PA. He died on 17 Jul 1961 in Locust Mountain State Hospital, West Mahanoy Twp, Schuylkill Co, PA. He was buried on 21 Jul 1961 in Lutheran Cemetery, Ringtown, Schuylkill Co, PA.
Kimber resided in 1930 in W Main St, Ringtown, Schuylkill Co, PA. He worked as machinist - coal mine in 1930. He was issued a social security number . He resided in Nov 1951 in Rocky Hill, NJ. He resided in Jul 1961 in N Center St, Ringtown, Schuylkill Co, PA.
Samuel Henry ADAMS was born on 17 Dec 1907 in PA. He died on 19 May 1910. + 4888 M ii Alvin Sylvester ADAMS was born on 22 Jul 1909. He died on 9 May 1965. 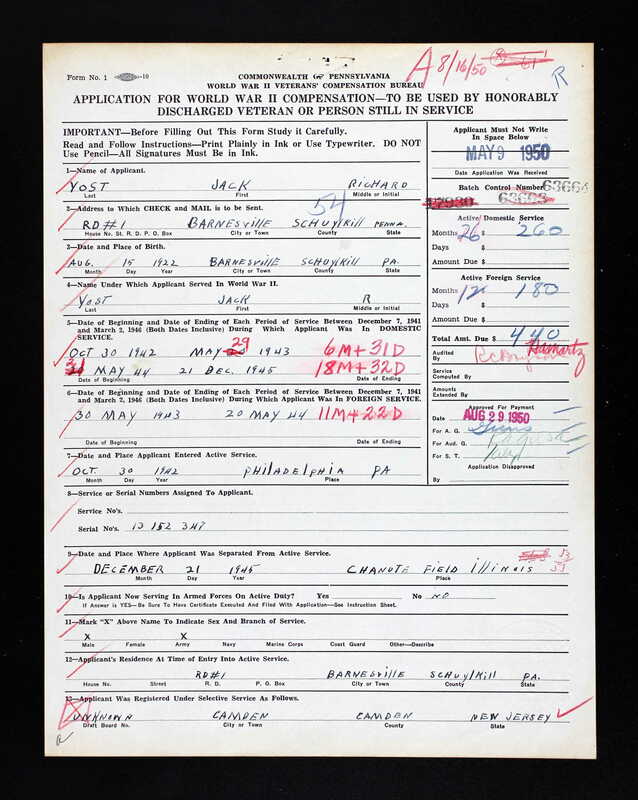 + 4889 M iii Harold Ambrose ADAMS was born on 4 May 1911. He died on 2 Apr 1962. Robert Eugene ADAMS was born on 6 Apr 1913. He died on 19 Mar 1914. Ides Willard "Ike" ADAMS was born on 23 Jul 1914 in Ringtown, Schuylkill Co, PA. He died on 9 Jul 1972 in Barnesville, Schuylkill Co, PA. He was buried in St Paul's (Old White Church), Ringtown, Schuylkill Co, PA.
Ike resided in 1930 in W Main St, Ringtown, Schuylkill Co, PA.
Ike married Creta Irene FAUST, daughter of Charles H FAUST and Anna GILBERT. Creta was born on 11 Aug 1918 in Ringtown, Schuylkill Co, PA. She died on 11 Aug 1993. She was buried in St Paul's (Old White Church), Ringtown, Schuylkill Co, PA.
Creta was issued a social security number . + 4892 M vi Rev. Warren Emerson ADAMS was born on 9 Oct 1917. He died on 15 Nov 1976.